← What is tooth decay? 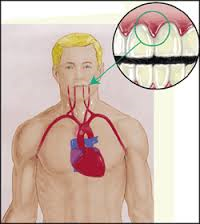 Studies have shown that there is a link between heart disease and gum disease. While the exact source is not known, it is suspected that bacteria that causes inflammation in the gums may be linked to coronary artery (heart) disease. This is because people with gum disease are twice as likely to have heart disease. So, make the effort- Floss! Getting regular teeth cleanings will not only save your teeth, but your heart!